Cesar hasn't connected with their friends on Goodreads, yet. Cesar Millan is a best-selling author, public speaker, and the internationally acclaimed star of “Cesar 911,” as well as the original, Emmy-nominated host of the “Dog Whisperer” program. With “Cesar 911,” he brings more than 25 years of dog experience and his status as the most recognized and sought-after authority in the field of dog care and rehabilitation directly to communities terrorized by unruly hounds. In December of 1990, 21-year-old Cesar Millan crossed the border from Mexico into California. He lived on the streets of San Diego, landed a job grooming dogs, and soon gained a reputation for his calming effect on even the most difficult cases. With a few dollars in his pocket, he moved north to Los Angeles and took a job washing cars Cesar Millan is a best-selling author, public speaker, and the internationally acclaimed star of “Cesar 911,” as well as the original, Emmy-nominated host of the “Dog Whisperer” program. With “Cesar 911,” he brings more than 25 years of dog experience and his status as the most recognized and sought-after authority in the field of dog care and rehabilitation directly to communities terrorized by unruly hounds. We’d love your help. Let us know what’s wrong with this preview of Cesar Millan's Lessons From the Pack by Cesar Millan. We’d love your help. 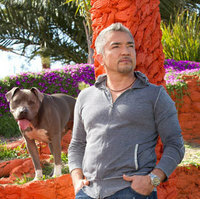 Let us know what’s wrong with this preview of Cesar's Rules by Cesar Millan. We’d love your help. Let us know what’s wrong with this preview of A Member of the Family by Cesar Millan. We’d love your help. Let us know what’s wrong with this preview of Cesar Millan's Short Guide to a Happy Dog by Cesar Millan. We’d love your help. Let us know what’s wrong with this preview of How to Raise the Perfect Dog by Cesar Millan. We’d love your help. Let us know what’s wrong with this preview of Be the Pack Leader by Cesar Millan.